Lingtzu’s 2017 award was a work experience placement with Iris Carr , funding to buy wood to make a cello and a copy of the Voller Brothers book. I spent 5 days at Iris Carr’s workshop. On the first day, she provided me with numerous reading materials about restoration, such as removing retouch varnish, crack cleaning, wood darkening etc. I raised questions about the reading materials and discussed them with Iris. She also introduced tools she uses, such as brushes used for retouching. She explained the purpose of each brush and educated me on topics such as the type of glue suitable for cracks and the shape of scrapers. She also introduced how to imitate the texture of wood before a retouching process and thus ensure that the texture approximates the original instrument after colouring. 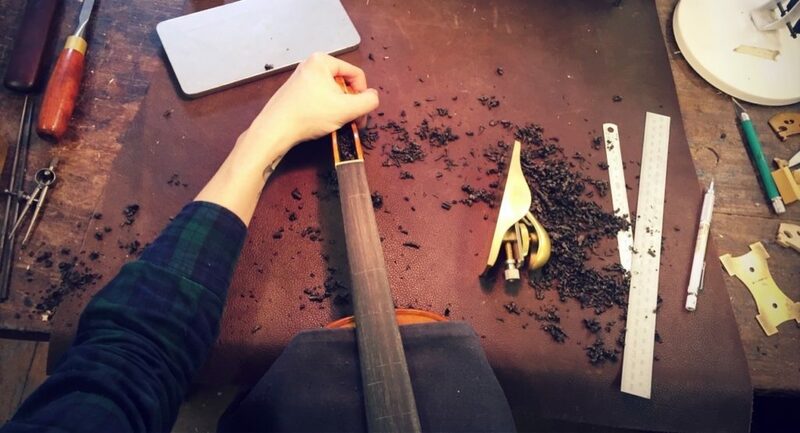 During my stay, Iris was repairing a cello made by Gaspar Lorenzini. She asked me to help her to replace purfling to the half edging that she had just finished. I initiated this process by drawing a light channel with my purfling marker. In contrast to a new instrument, an old instrument does not have a complete edge. Therefore, I could not identify a starting position for drawing a channel for the purfling. Instead, I had to locate the original purfling position to establish the new channel. And than I cut out the channel and try a piece of purfling in it. To make sure it just slide in without being loose or tight. Finally, I placed a strip of purfling in the channel after ensuring that it was in the right position. The next day, Iris taught me how to produce wood texture and how to colour, and I started retouching. In addition, I did retouching for peg bushings. Prior to the retouching, Iris provided a demonstration of the appropriate techniques. Specifically, she demonstrated several techniques such as how to evaluate the colour of wood and reflections from different angles. She started colouring the cell layer by layer and explained the sufficient level of dryness required for the brushes used in this process. She adequately explained minor details and supervised me while I executed the process, which was extremely helpful. I have ambivalence about retouching. No fixed process is available for retouching; this is because each cello has a unique colour, wood, and decorative pattern and because each individual has his or her unique colour-mixing process. I believe that I gain knowledge with each retouching experience. She continued to demonstrate several additional aspects of retouching. I put some studs on the front section of a violin. On the final day of my stay, I attempted to fit a piece of wood on a worn edge. Although I did not have sufficient time to complete it, I still benefited considerably from this experience. I was awarded a financial grant to buy violin wood as well as a work experience placement in my first year at Newark. 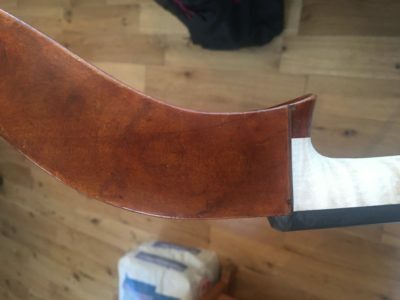 I am so grateful that I was able to afford a set of good quality violin wood. The model that I chose is the “Titian” Stradivarius violin, 1715, one of Stradivari’s finest golden period instruments. I was told that this violin is played by Cho-Liang Lin, a Taiwanese-American violinist. The sound is very powerful and colourful and impressed me. I really like the flame on the ribs which I bought, but I encountered great difficulties in bending them. I am working on the front and back for the moment and expect to finish this violin by the end of June. 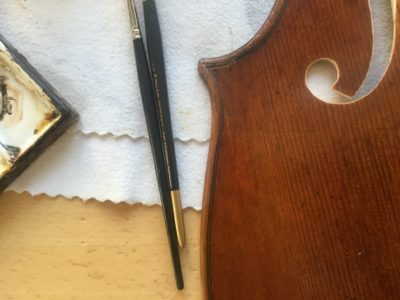 I am thinking about trying some antiquing techniques on this violin given enough time. I was very excited to have the chance to have work experience at The Workshop in Cambridge. On April 9th I arrived in Cambridge with several projects in my mind. Christopher Beament was my primary tutor and Juliet Barker also took care of me. 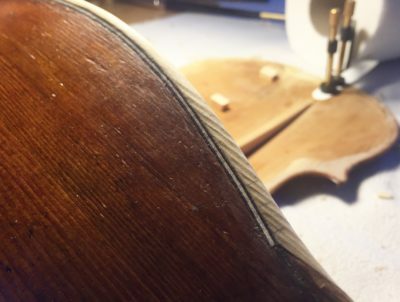 During my week there I carried out set-up work on two violins that I made before, including fingerboard, top-nut, saddle, pegs, bridge fitting, soundpost, neck reshaping and retouching. Chris taught me some different but more efficient and simpler ways. For example, I used to finish the fingerboard completely and then glued it onto the neck. Now, I only finish the scoop underneath and then glue it onto neck straight away. I finish the cross section work of fingerboard on the violin afterwards. It is easier to hold the fingerboard this way and doesn’t require the fingerboard holder. It is helpful to discuss different methods with professionals. Juliet told me that “efficiency” is very important. You need to find a way to perform quality work with less time. This is what I need to improve. Chris also said that all I need is doing it again and again, and letting the muscles memorize and get used to how to work. Practice makes perfect! It was an absorbing week. It also made me realize that you have to question everything. There are lots of different ways to do the same job. I have to experiment to find the one that gives me the results that I want. On the whole, it was a great work experience, exhausting but fun! I am extremely grateful to the RAB Trust for offering me a place in The Workshop, and would like to say a big thank you to Chris and Juliet.